MEDICAL TYRANNY at the Fordland medical clinic? 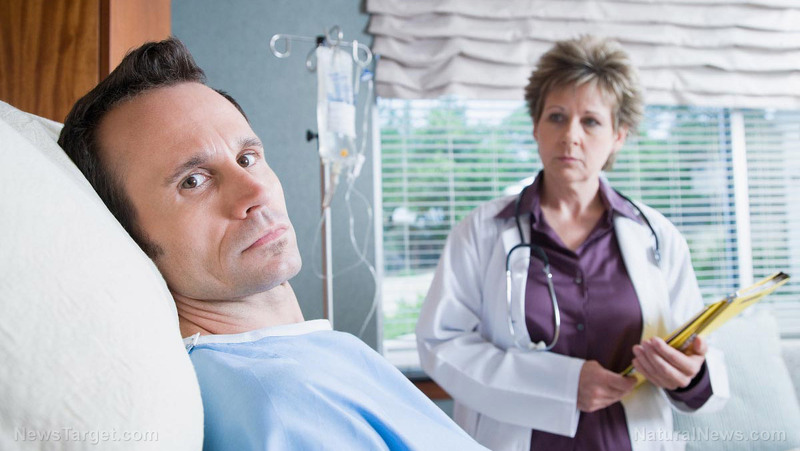 Do you go to your doctor to get lied to? To be deceived? Well as hard as it is to believe, that is the admitted and ongoing policy at the local Fordland Clinic. I wanted to alert the public that at the Fordland Clinic that they seem to be pushing a Federal Mandate, where patients going there for normal visits to their doctor, are unknowingly and often against their wishes, evaluated by a mental heath worker! I had one of these people just show up unannounced, unwelcome, and uninvited in the patient treatment room that I was in. (What’s next? Perhaps an IRS agent showing up? Or your ex’s attorney?) She used subterfuge and lies, when asked directly if she was with “mental health”. She used euphemisms designed to obfuscate rather than tell the truth, and would in the end not admit to who she was or why she was there. Blindsiding and lying to the patient is over top federal intrusion into our health care! ( not to mention: What type of person that would go along with this stuff?) To make matters MUCH worse a Fordland Clinic (nurse Sonia) admitted to this deception and defended it! That is when I had to hang up on her. If you are looking for Russian collusion this might be it. If this does not make sense, you should educate yourself about the abuse of psychiatry and mental health in the old soviet union. I have a strong feeling that this is a Federal mandate, just like all of the “no-gun”, and the pro vaccination signs that are plastered all over the facility. They even push vaccines on their phone system messages while you are on hold. Funny how they want to vaccinate you, that is until you ask them if they will be personally responsible (indemnify you) for any damages caused by a vaccination. Then they expose the truth of their absolute lack of confidence in the safety of vaccinations. Efficacy is an entirely different discussion. Shocking video shows Arizona police officers forcing their way into a home to remove an unvaccinated toddler …. Did they send in the “nut job evaluator”, the “enforcer of PC behavior”, because I must be nuts because I don’t vaccinate or take big pharma poison? Just like in the old USSR the very definition of insanity is going to be anyone that disagrees with the omnipotent state. At the very least this blindsiding and lying to the patient is unethical. It should be illegal as well IMHO. If you have any definitive information on this apparent Federally mandated program please forward your information to MFP and it will be held in the utmost confidence. After wasting an hour of my time, and not getting to the right people (Incompetent government as usual) I got this number: 855-408-8557. Will this be just another wild goose chase? I suspect it will be, Will keep you updated. As predicted this “agency” could not and would not do a damn thing, not even file a “complaint”…. this is how government works folks, and I could write a heavy tome on my experience in that department, but this is not the time nor the place. I really think that the time is getting near when ‘we the people” will have to of necessity have to deal with the mess that the criminal psychopathic legislature has created. What do you think? Let me know in the comments below. Note: This article is far from exposing the full extent of the damage done to patients, by the mindless order followers, at Fordland clinic. They appear to not have seen a single Federal mandate that they will not force upon their patients. On the dental side of this facility they force patients to undergo exposure to ionizing radiation regardless of their wishes. Even people whose parents have died of brain cancer, like myself, that would rather minimize or eliminate such exposure all together. Much of the time they “forget” to protect your thyroid with shielding. I had to undergo 3. Yes 3 xrays when I recently got a crown. The employees even put their fingers in the radiation beam on a regular basis and are told that this is safe! One also exposes themselves to 2g wifi in this facility. 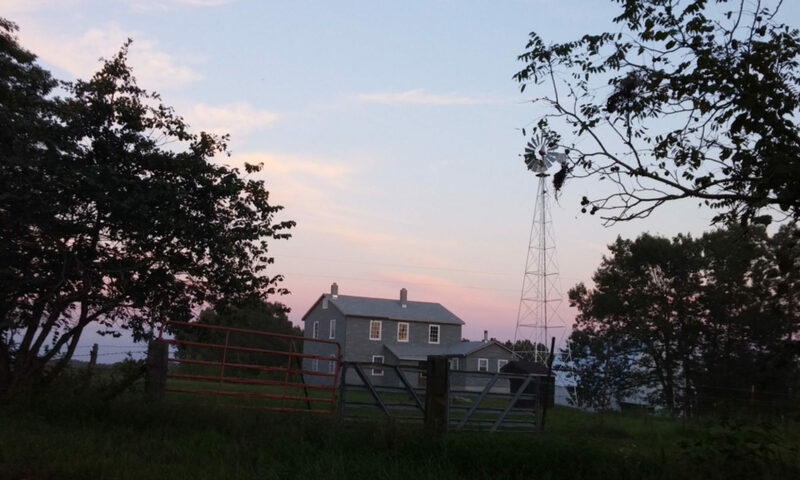 ( 1, 2 , 3, 4)(FYI I have everything running over Ethernet at home for my health) There may even be 5g coming off of their router, I will have to check this out the next time that I go there. 2g and 5g are both non-ionizing radiations, but there is just too much evidence of very serious health effects from being exposed to it, especially the 5g. I for one do not want to take chances. UPDATE 4/12/19: I ran an application called “WiFi Analyzer” at the clinic yesterday and discovered that there are 3 routers in the building that are broadcasting both 2G and 5G frequencies. Both can cause cancer but 5G is a magnitude more dangerous and it like 2G is linked to brain cancer. No one at the clinic was even aware of the 5G in their environment. In summary your privacy and health do not even seem to be on the radar at this clinic, just like all of the other Federally controlled medical facilities across this country. “……A PDMP is a system of surveillance of law-abiding citizens, but the House still voted for it! The PDMP (Prescription Drug Monitoring Program HB 188) that passed the House (click here for the votes) is now set for hearing in the Missouri Senate. And I am certain that if the psychopaths in the Missouri legislature pass this draconian “spy on the citizens” bill that the Fordland clinic will enthusiastically go along. After all the state can terrorize anyone in this monopoly that does not go along with revocation of their permission slip to earn a living. i.e. their medical license. Land of the Free? Certainly not when it comes to your being able to get the medical care that you desire. IMHO it is the horrific diet of the American people that AMA medicine ignores in favor of big pharma’s poisons and profits., that is a major driver in this trend. Excellent article by Dr Mercola. FB is out censoring my posts in force today….. 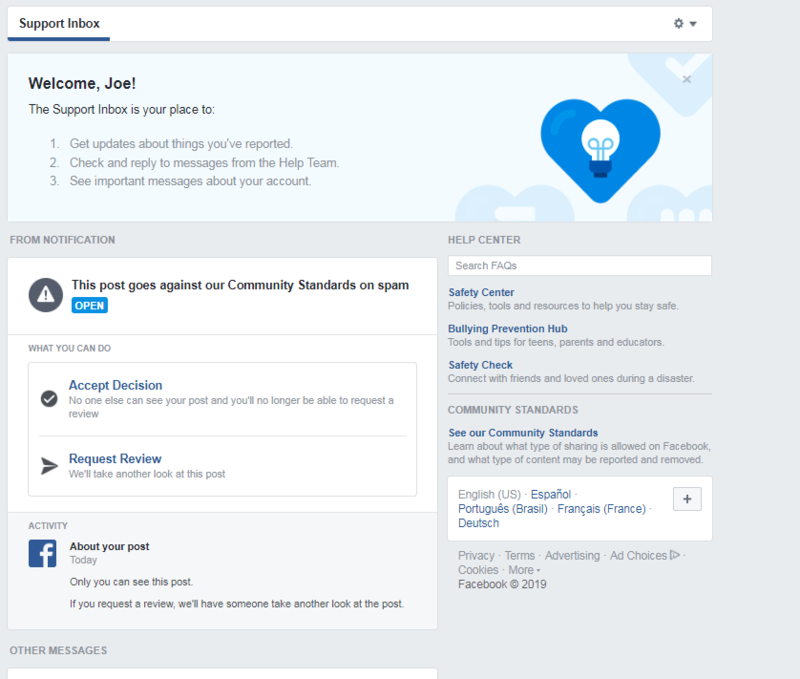 The anti free speech agenda at Facebook doesn’t ever let up, but they are changing their tactics. I just got a notice (see the screen capture) that my post violated their completely ambiguous, and selectively enforced “community standards”. The link to see the post, did not work so I can not tell you what was so offensive that their AI algorithm picked it up in minutes. Nor could I actually type any text to present my case, because when I clicked on the request review button, it immediately went to under review with no opportunity to make your case. You are seeing what the totalitarian, fascist, Satanic, New World Order is going to look like. With “christians” in general being clueless and supporting the things that are bringing this evil down upon us. 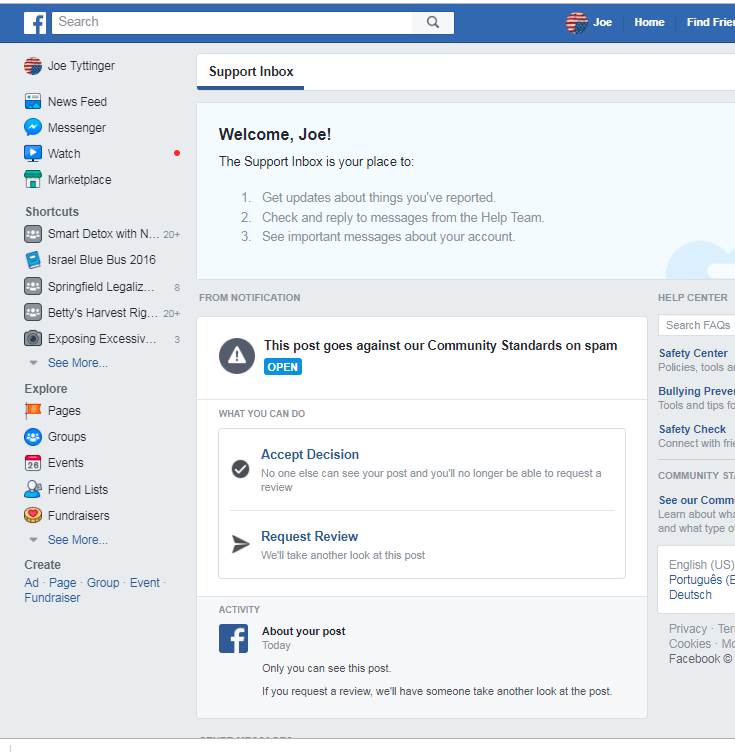 Above is the kangaroo court that FB presents when you violate their “community standards” . You are misled into believing that you can actually view the offending post, but you can’t. Then you are falsely led to believe that you can present you side, (for the post that you have no idea of what it was about because you can’t see it), but even that is a lie in the bizzaro world of FaceBook. I was never allowed to view the offending post nor to type in any explanation, or question at all about their action. Fake mainstream corporate news is all that they want you to see. What you cannot hide is genocide. The Trilateral Commission just announced that 5G will be the backbone of “smart cities”. This should send a chill up your spine. The FCC is forcing 5G upon us. Virginia Farver joins Dave Hodges as she unveils newly discovered health effects of 5G. Firestone at Battlefield Mall (1) is to put it bluntly, run by a bunch of incompetent low lifes. I went there last year for new tires and requested that I keep the old tires, as there was a lot of thread still left on them. I did not check my trunk until a day later, and guess what? No tires! Out of 2, $100 tires! The story of this visit did not end there: Yesterday I was traveling out of town and had a failure of a tire. I went to the trunk expecting to mount that “doughnut” that I used to get to Firestone the last visit, only to find that the tire was utterly thrashed and useless, and Firestone never bothered either to offer to replace it or to notify my that it was not in usable condition. 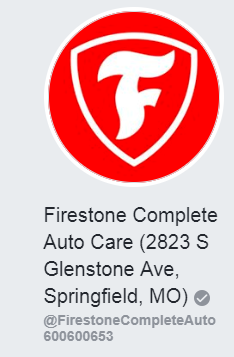 If I were you I would not only avoid this specific Firestone location, I would avoid the Firestone company like the plague. FWIW I send an email to their public relations email and they did not even bother to respond. Par for the course….. 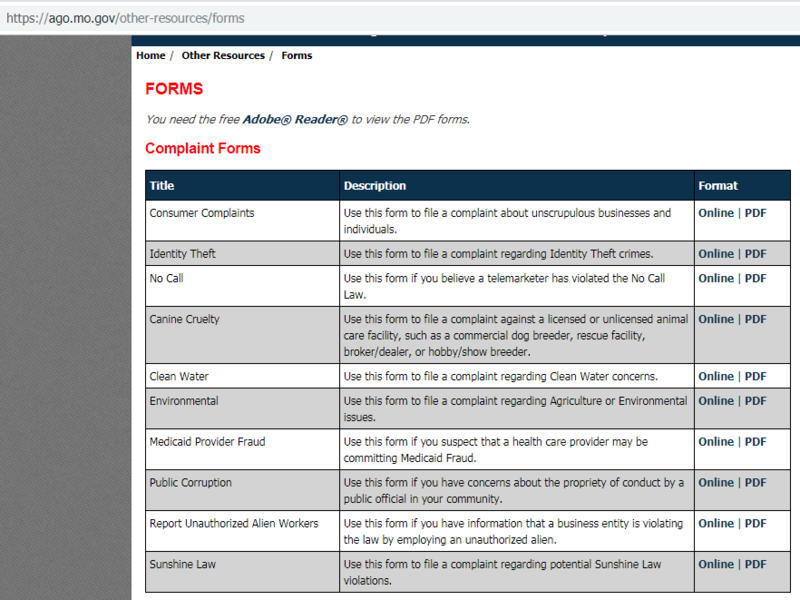 The criminals at Home Depot are selling heavily polluted and toxic, human excrement as “eco friendly” fertilizer, and not marking it as such: Not to mention that it is being used on most of your supermarket food crops….. This is the same chain that subjects you to MonSatan’s cancer causing RoundUp 1, 2 in your lungs and blood stream whenever you dare go near their garden centers. The bombshell documentary has now dropped: Biosludgedexposes the criminal pollution enterprise known as the “EPA,” which produced fake, fraudulent science in order to “legalize” the mass pollution of America’s soils and croplands with toxic sewage sludge.